You’ve heard about SMART Goals. You may have even heard about DUMB Goals. These things are all wonderful. 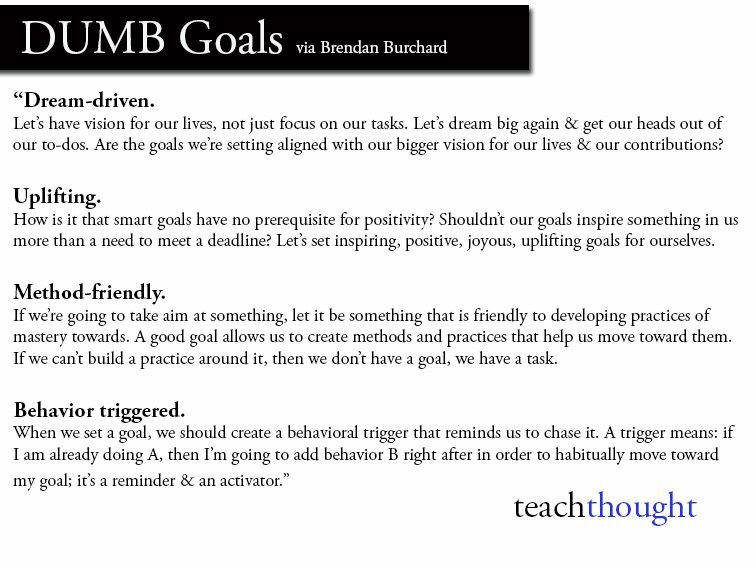 I’m not here to bash goal setting. I’m a big advocate of goal setting. Goals have helped me make big moves in my life. But I also have to be honest and say I’ve also fallen short of my goals... a ton. Only 8% of people achieve their New Year's resolutions. New Year's resolutions aren’t always the best or most achievable goals. But even when I’ve done all the right steps in my goal setting, things don’t always work out. I’ve made my goals SMART, written them down, shared them with other people, visualized achieving them, reflected on what’s working and every other trick I know. Even after that, I have failed to meet my goals more often than I’ve achieved them. That’s even more true for the big, life-changing goals. That makes sense. Our world is set up to help us maintain where we are, not to go changing ourselves whenever we have some brilliant new insight. The world is set up to help return to normal, i.e. our old state. However, I realized last night that there is something else that has changed my life more than setting goals has. Making decisions. For instance, when I decided to go to University of Florida over Georgia Tech or MIT, that has had a ripple impact on the rest of my life. Another huge decision I made is when I decided to start my own company. The decision to start my own company is a great case study. I had a goal of starting a company in one form or another for 10 years. I had a goal of getting my coaching company off the ground for 2 years. Then I left my last startup and after some contemplation, I decided I was going to start the company. In those 2 months I made more progress than I had made in the last 2 years. What was the difference? For me, I was deciding just as much what I was giving up as well as what I wanted. I wasn’t going to have a steady salary. Hell, I probably wasn’t going to have any salary for a while. I wasn’t going to have the free time I had before. I wasn’t going to take as many trips with friends. I wasn’t going to date as much. All these things happened because of the decision I made. Decisions by their very nature shut down doors of Other Opportunities. That allowed a tremendous amount more space for new things to happen. I now had time to work on my business. I was absolutely amazed at how the things I thought would take months were done in weeks. I had stepped into the new possibilities that the decision had created. This doesn’t mean you can cheat the system. Saying “I’ve decided I’m going to lose 10 lbs” doesn’t work any better than having a goal of losing 10 lbs. But deciding that you’re going to be healthier can be a game changer. When you honestly look at what you have to give up and say “Since I’ve decided to lose 10 lbs, I can’t snack after 10 p.m.,” things start happening. So what big decisions have you been thinking about, but haven’t made yet? I’d love to hear your thoughts below.